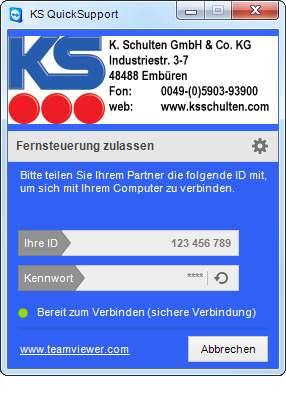 Please use our KS QuickSupport for an easy processing of your Support problems. Due to the TeamViewer we are able to connect to the Internet within a few seconds. Just download the KS QuickSupport on your computer by pressing one of the below-mentioned buttons. In order to have the possibility to use the KS QuickSupports regularly please save the Download on your desktop. Start the Support-Software by executing the file. Please let us know your ID so that our employees can connect to your PC.